it helps the elderly to preserve mental health. 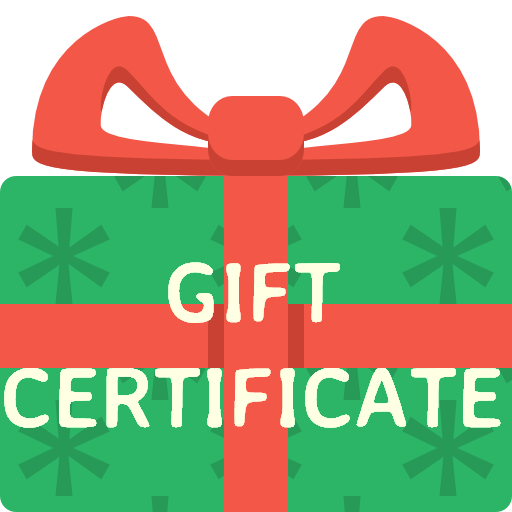 You can give LearningChess gift certificate for all occasion because you can freely specify the short text we write on the certificate. So, the opportunity is here now; you can buy LearningChess gift subscription in a few easy steps below, online. 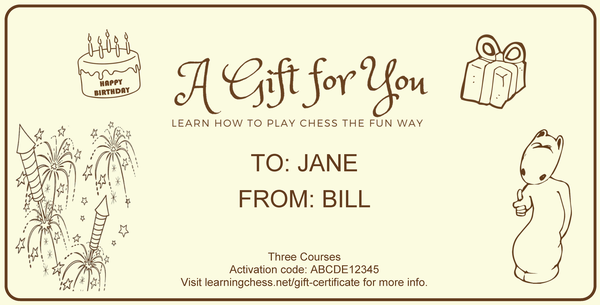 One year gift subscription for one chess course is $14.99. One course contains 36 interactive, online lessons, 45 minutes each. Special promotion: three courses bundle in gift subscription for one year costs only $39.99. The online lessons can be used on notebook, desktop computers (PC/Mac), tablets, and mobile devices. If the beneficiary is a complete beginner, it’s recommended to start with the Level 1 – Beginner Chess Course. If hardly anyone can beat the beneficiary among his/her friends, it is recommended to start with the Level 3 – Advanced Chess Course, which will prove a hard nut to crack. 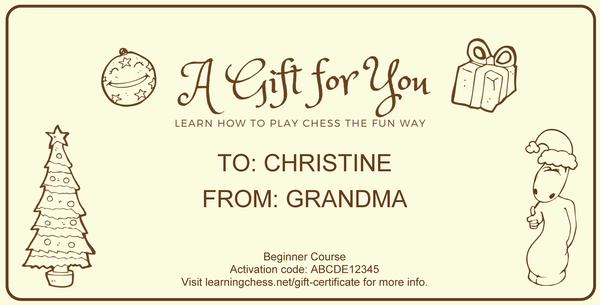 How to purchase LearningChess gift certificate? Step 1 – Select the payment option below. The payment will be processed with PayPal. Step 2 – Contact us, and let us know what should we write to the ’TO’ and ’FROM’ fields of the certificate (please check the samples). We recommend nicknames here. Step 3 – If you purchased one course, also let us know which course you would like to present (Beginner, Intermediate or Advanced). Step 4 – Please inform us which certificate we should prepare: Christmas, birthday, anniversary, other. If you have chosen anniversary or other, please also specify the short text (e.g. Happy 30th Anniversary, Happy name day). 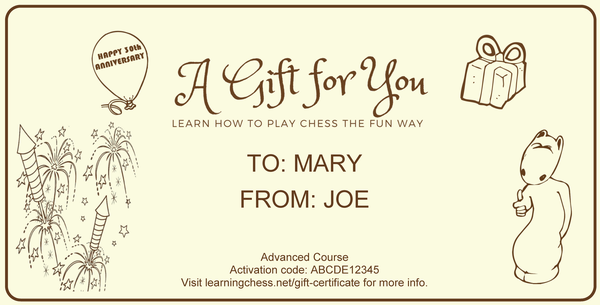 If you have any other question in connection with the LearningChess gift certificate, please do not hesitate to contact us. A wonderful gift to receive this Christmas; a great incentive to learn chess the proper way and to improve one’s chess ratings. The lessons are done in a professional and hugely entertaining way. The learning chess net website is also very reputable and respected with great reviews in the chess world.